Description: BNSF 2014 & BNSF 2915 Sit quietly in the B-Yard after a hard days work. Photographed at 17:27. Description: In for service at the sand tower at the BNSF Galesburg yard. 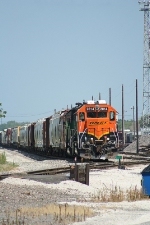 Title: BNSF 2014 leads a local. Description: A bit over powered dont you think? Title: BNSF 2016 works the dyno nobal plant. Description: this is the 835 local or called the cosgrove turn.